The best server book in the market! For the server that wants to look professional, and be seen as one too! 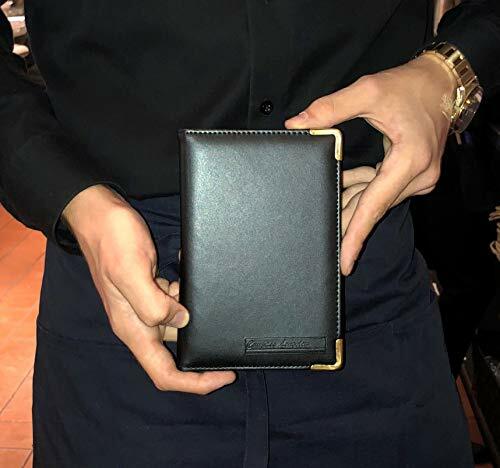 This book exemplifies style and is the perfect accessory for the professional server. Image is important, especially in the service industry. Perfect your image and the better your tips will be! Combined with exquisite space saving designs, this book serves a functional purpose as well. Purchase this book to increase your professional image while keeping organized at the same time! Never end your shift with balls of cash and receipts in your apron again!!! ✔️DISPLAY YOUR BEST SELF TO THE WORLD - This server book was hand crafted with the intent to show your customers, co-workers, management and anyone else who looks upon it that you carry yourself with great pride in your image. Sleek, smooth and elegant there is NO other book like this one. Others try to imitate but our book is the best looking one available. The PU leather contrasts perfectly with the gold metal corners to combine grace and beauty all in one package. ✔️COMPACT AND EFFICIENT - Smaller than most books in the market at approximately 4.75 x 7 inch, you will have no issue sliding book in and out of aprons. Designed to be comfortable in all hands, this book includes 9 pockets for optimal storage. Our book is the fastest and easiest product to use on the market! ✔️ECONOMICAL FUNCTIONS - 9 pockets provide more than enough room for storage of receipts, cash, cards, memo pads (not included), feature lists and much more! Long zipper adds security for cash or other small valuables you wish to be hidden from plain sight! Pen holder in the center is small enough to allow the book to close while giving a pen/pencil ample room for safe storage! ✔️SMALL BUT STILL TONS OF SPACE - This book was made to be lightning fast and still offer huge amounts of space. The zipper pocket alone has enough capacity to hold 100 bills at a time! ✔️BUILT TO LAST - Tested in the serving industry, this book was designed to withstand the demanding and fast paced work environment. Reinforced leather stitching, strong fiberboard built within and shiny gold metal corners ensure this book is of top quality! This book will not rip, break, bend or cut!! If you have any questions about this product by CompassLongview, contact us by completing and submitting the form below. If you are looking for a specif part number, please include it with your message.